The IRS denied tax-exempt status to 57 religious or charitable groups in 2015, according to recent data from agency. The IRS rejected a total of 67 applications for tax-exempt status in 2015, and religious groups comprised the majority of denials. There were 92,653 total applications by religious and charitable groups in 2015. Of those applications, 86,915 were approved, 57 were denied, and 5,681 were left in limbo. Attorney Jordan Sekulow, executive director of the American Center for Law and Justice, represents a number of conservative and pro-life non-profit organizations that have faced long battles to have their tax-exempt status approved by the IRS. Among his clients, two are still awaiting determination by the IRS—one group has been waiting for more than six years, and another for nearly six years. "The process is supposed to be a fairly quick process," says Sekulow. "If the IRS needs more information, they’re supposed to ask you for that." According to the IRS, the 5,681 applications that were not adjudicated in 2015 generally did not include required information, were incomplete, or were applications that were withdrawn by organizations. Sekulow isn’t persuaded that the IRS is being open about the process. "We saw in some of our cases questionnaires that were being sent out by the IRS and follow-ups to [non-profit] applications, and they were asking questions that would intimidate people," he said. "A lot of people would say, ‘Okay, nevermind,’ and quit the process." "The IRS was wrong then and while the agency says it has stopped such discriminatory action, there’s really nothing that leads us to believe that this administration has really changed," he continued. Sekulow is taking his clients’ cases to the D.C. 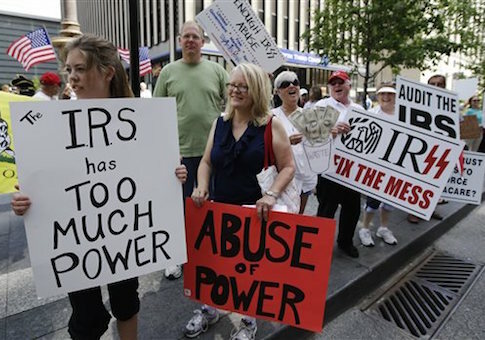 Circuit Court of Appeals next week to challenge the IRS’ targeting of conservative groups. Many of the groups he represents that have gotten approval have had to put up with demands by the IRS for Internet passwords and usernames, donor lists, and charitable activities of family members. Sekulow also stressed that the waiting period these groups have to go through can be as destructive as being denied tax-exempt status. "The IRS is playing the ‘delay game’—keeping these organizations guessing about the status of their applications and ultimately whether their applications will be approved," said Sekulow. "I think that keeping people hanging in the balance can be as destructive as an outright denial because lengthy delays can stop the momentum that many of these start-up groups experienced. "Lengthy delays may not only sap the momentum of a group, it produces a chilling effect on the constitutionally protected speech," he said. The IRS did not respond to requests details regarding the 57 denied applications or the 5,681 applications that have neither been approved nor denied.